I learned quickly not to complain about how difficult life with little children can be to parents of children that are all grown up. They were quick to warn, "Just wait until they are teenagers." I smiled when I heard this and acted as if I wasn't phased by the comment. However, on the inside I cringed, worried, and acknowledged that they were absolutely right! Today, I got frustrated with my youngest son for walking too slow back to the car, my oldest son because his clothes were all over the house, and my oldest daughter for picking on her younger brothers. Pretty minor stuff. As my children get older, I know the frustrations will continue and the situations will grow increasingly more complicated. This week's experience celebrating Sandra McLeod Humphrey's birthday taught me that the teenage years may not be something to fear, but to look forward to. And maybe establishing some healthy habits now could actually make a world of difference. Sandra McLeod Humphrey was a clinical psychologist for 31 years at a state hospital working with young women with character disorders (Nancy Jill Thames). She said in an interview with Word Salt, "I think I can safely say that I was the only psychologist on the staff who actually enjoyed writing patient assessments and court reports." Upon her retirement in 1992, she followed her love of writing by submitting stories to children's magazines, and then moved on to writing children's books. She has published many books on character and moral development including It's Up to You...What Do You Do? and Hot Issues, Cool Choices. In an interview with Stuart Aken she said, "My passion is to inspire youth to develop strong character, to believe in themselves, and to dream dreams (their own dreams), and every time I receive letters or e-mails from my readers who tell me how much one of my books has helped them, that is most definitely a 'peak experience' for me." All of Sandra's books would be classified as middle grade and young adult. 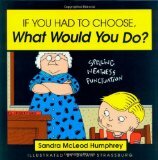 However, when I read her book, If You Had to Choose, What Would You Do?, I saw an opportunity to use the book even with my own young children. This book contains 25 "problem situation" stories that are approximately three pages in length. I liked that each story clearly presented a moral dilemma and the thoughts of the main character as they struggled with the decision. On Sandra McLeod Humphrey's website, KidsCanDoIt.com, she states, "It is never too early to begin talking with our young people about personal values and helping them define their own code of moral conduct." This week, we read one of the stories from If You Had to Choose each night at dinner time. I chose stories that I felt my 7 year old daughter and 4 year old son would be able to process and discuss. A few of the stories we read were about sneaking into a movie theater without paying, becoming friends with the unpopular new kid at school, and buying a gift for a teacher but not the grouchy teacher's assistant. My daughter jumped at the chance to voice her opinion once the story closed with the question, "What would you do? Why?" My son was able to contribute to the conversation after we compared the story to a situation in his own life. We found that with every story that we read, my oldest two children were willing to talk and ask questions about the situation. My wife and I were able extend the discussion by telling stories and situations from our own childhood. Every night my oldest two children asked for another story, but I decided to keep it special by reading only one. My son suggested, "Maybe, we can read one for breakfast." My daughter showed her disappointment, after an overnight with her cousin, when she said, "Awww man! I missed last night's story." Later, after her brothers went to bed I read her the story just so she didn't feel left out! This reading experience taught me that having discussions about moral dilemma scenarios are very enjoyable for everyone in the family. I learned that discussing topics like this may be a great habit for our family to develop to ensure that as my children grow up they know that Mom and Dad are open to discussing the difficult and complex social situations that they will encounter when they are teenagers. Sandra McLeod Humphrey suggests, "Have fun while you share your values with your children and help them to develop their own." I probably will still worry about my kids becoming teenagers, but now I feel small steps I take now could make a big impact on establishing clear lines of communication with my children. Thanks so much for sharing my birthday with me! I don't think I really have any birthday traditions, but I do have a favorite birthday memory! Twelve years ago we were down from our usual four dogs to three dogs and my husband suggested that we visit the local Animal Humane Society (where we get all our dogs and cats) to adopt another dog. I immediately fell in love with a white German shepherd who reminded me so much of my white German shepherd Nike who had shared my apartment with me during grad school. This shepherd, however, was in a separate kennel in the back because they weren't sure he was "adoptable." He had been so badly abused that he crawled rather than walked and flinched whenever anyone lifted his hand. Needless to say, our white German shepherd Vega is now twelve years old and one of my favorite dogs of all our dogs. That had to be one of my best birthdays ever! Sandra, thank you so much for sharing your birthday memory. We hope you have a fabulous birthday! I also must thank you once again for all your support and mentions of Happy Birthday Author! Lastly, be sure to check out Sandra McLeod Humphrey's latest book, They Stood Alone! : 25 Men and Women Who Made a Difference (for kids 10 and up). Happy birthday, Sandra! May many children be encouraged to make good choices and to trust God to help them in difficult situations. Thanks so much, Melissa, and I wish the same for all our kids! Thanks so much for celebrating my birthday with me, Eric, and I LOVE the picture of your kids! I am so glad we have met through social media! It was a pleasure to celebrating your birthday with you! Here's to many more!! Happy birthday, Sandy! Your books look great. Vega is quite a charmer. So glad to be here to read about your accomplishments. Thanks for stopping by, Alice, and Vega is definitely a "charmer!" Wonderful read Eric and a very happy birthday to you Sandra. I love your work and believe that every school library should have it on their shelf. You just know that your work is right on target when kids keep coming back for more as they do yours. Keep up the good work and I will continue to follow you. As a writer of motivational children's stories (albeit short ones for the younger age group), I am enjoying a deeper, more meaningful experience from your excellent works. Thanks so much, Linda, I think we share many of the same objectives! Thanks for stopping by! Linda - Thank you so much! I agree that every school library should have Sandra's books! What a wonderful idea! Not only have you allowed a way for Sandra's readers/followers to wish her a Happy Birthday but also a means to walk with her down memory lane! You're so right, I love what Eric does with his Happy Birthday Author blog! Thanks for stopping by! Thanks Sharla and Sandra! There certainly was lots to celebrate today! Thanks so much, Sid, and thanks for dropping by! Good post, and I love Sandra's goals. Don't fear teenager years. I love mine and have so much fun with them. Yes, there have been heartbreaking challenges, so it hasn't all been fun. But it is a joy to see them maturing, to have a deeper relationship of mutual respect, and to learn things together. What a great attitude, Jill, and it is a joy to be there to see them mature into responsible, caring individuals! Thanks for stopping by! Thanks Jill! I am feeling better about the teenage years and I love hearing about how much fun you are having with your children. Thanks for stopping by the blog! Happy birthday Sandra -- I hope your day is filled with everything you deserve, which is only the best. Thanks so much, Peter, and thanks for stopping by! You are very impressive and it appears that your books are helping so many children and their families! What a way to celebrate life. What a beautiful comment, Cherrye, and thanks for stopping by! It's such a special gift pf writing that Sandra has been blessed with and developed. Children wanting so much not to miss a story and the sharing of a family. All as it should be. Sandra, the white German Shephard story is especially endearing. It says a lot about who you are to take an abused animal who probably only wanted to be loved and give them a special place in your heart. Vega is much like your "Sandy"--so loyal and so much a part of our family! Thanks for stopping by, Mamie! Happy Birthday to Sandra!!!!! Great post, illustrating how effective, relevant, provocative, and practical Sandra's books are for families with young children. I wish I had known about them when my children were young. You're so right, Linnea--Eric did such a beautiful job with this post (actually, all his posts are wonderful!) and he is such a great parenting role model! Thanks for dropping by! Thanks linneann and Sandra! I am so glad that you enjoyed the post! WOW, thank you so much, Deirdre, and thanks for stopping by! Happy Birthday, Sandra! I pray your day is blessed!! Thanks so much for the BD wishes and for stopping by, Heather! Happy birthday, Sandy! I love your story about Vega. I'm a sucker for rescues, especially the so-called damaged ones, and have a houseful myself. I wish I'd had Sandy's books when my own sons were growing up. I plan to get them all for my granddaughter! I just finished reading 'They Stand Alone! ', and I highly suggest it for readers of all ages. Thanks so much, Darcia, I so appreciate your ongoing support and thanks for stopping by! Happy Birthday to a special woman, extraordinary writer and good friend. Your books will be treasured by both children, their parents and teachers. Your words will be responsible for changing young lives in the best possible way. Have a great day!!!!!!!!!!! WOW, what an endorsement, Micki, and thanks for stopping by! Thanks so much, Peggy, and thanks for stopping by! Happy Birthday, Sandra. Many, many, many, many, many, many more. Thanks so much, Barbara, and thanks for stopping by! Happy birthday, Sandra. May you have many more prolific years ahead of you to inspire the dreams of children everywhere! What a beautiful comment! Thanks so much and thanks for stopping by! Happy Birthday, Sandra, and have a very prosperous year ahead!!!!!!!!!!!! 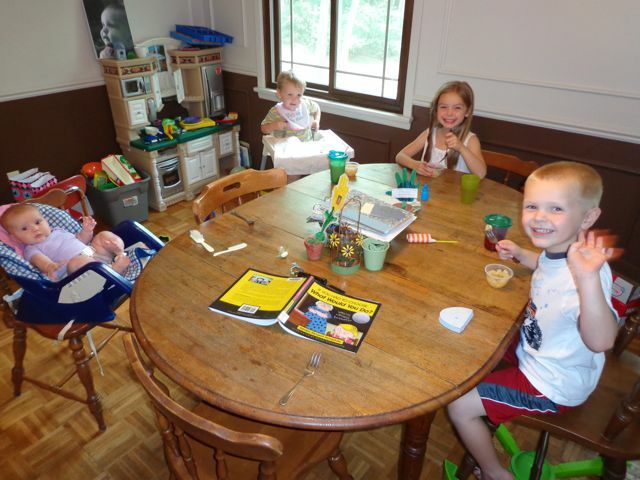 I love the sound of Sandra's books, and how you were able to create your dinner table discussions - such a great idea! And as a dog lover and adopter of shelter dogs I loved her special birthday story - I'm so glad she was able to rescue Vega! Happy Birthday, Sandra! Susanna, the dinner table discussions went extremely well! I hope to continue using Sandra's books even after her birthday. Thanks for stopping by to wish Sandra a Happy Birthday! Thanks so much, Susanna, and I'm so glad Vega is part of our family too! Thanks for dropping by! It's a true honor to have been invited to your birthday celebration. I love your books. They're inspirational and charming, just like you. Andddddd, to top it off you're a dog lover. Wishing you the same joy you bring to others. Thanks so much, Olyn, and thanks for dropping by! I appreciate your comment, Darlene, and thanks for dropping by! To a very special lady and a inspirational author! May you have many more birthdays! Thanks so much, Lee Ann, and thanks for stopping by! Paul, Thank you so much! So glad you like my blog! Happy to have you as a subscriber!